You roughly spend 8 hours a day, 40 hours a week, 160 hours a month, 1,920 hours a year in your office/at your desk. With only 168 hours in a week, you’re spending nearly a quarter of your weekly life (sometimes even more) in the same space. That’s quite a bit of time if you ask me. 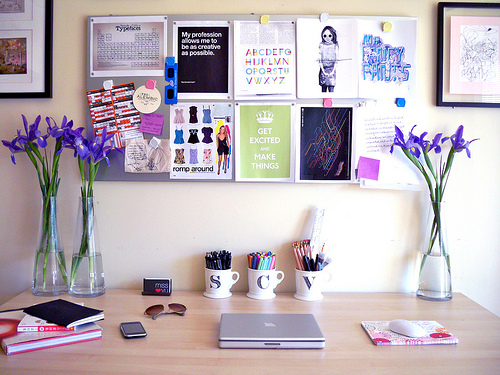 With that in mind, you really need to find a way to make your working space feel like your own. Literally. With the weather finally starting to warm up, you’re able to find plants in nearly every store under the sun. Pick up a low-maintenance shrub or flower to bring some life to your desk. Click here for some office-friendly plant ideas. Another idea is to get a fish. Mind you, you’ll need to pop in a weekend feeder on Fridays so the poor thing doesn’t starve, but sometimes having a little, fishy friend next to you 40 hours a week can be comforting. If you do go with the fish, I’d suggest a getting a betta given how low-maintenance they are. Pictures of anything! Memorable shots of your friends, family, significant other, pets, or your favorite TV show (Parks and Rec, anyone?) all suffice as great office/desk additions. If you’re ever having a rough day, it’s always comforting to look up and be reminded of someone or something that makes you happy. Your office is most likely stocked with tons of snacks and treats, but sometimes it’s nice to have your own little stash of goodies that your office likely wouldn’t buy in bulk. For instance, I love Peanut M&M’s, so I almost always have a bag in my drawer in case I have a taste for them. Also consider having an easily accessible candy dish so your desk seems more approachable to coworkers! For me, bright colors and fun patterns tend to cheer me up. Obviously take this with a grain of salt if your office culture is a bit more conservative, but a bright, colorful calendar or pen holder can make a huge difference if you’re working on a blank, sterile desk.